So you want to bring Affinity Designer files into After Effects? As I begun to fall in love with the workflow within Affinity Designer I started to ask myself, “How can I save Affinity Designer vector files for After Effects?”. Since I’m a Motion Designer, Affinity Designer by itself would be useless as some level of integration is needed for me to utilize it. So would this crush end with a broken heart or would it flourish and blossom into a long term relationship? A person can’t deny that the integration between Adobe Illustrator and After Effects is a strong one. It doesn’t get much easier than importing Illustrator files directly into After Effects. However, there is room for improved integration, but scripts like Overlord from Battleaxe (the maker of Rubberhose) has started to fill the holes between the two programs. 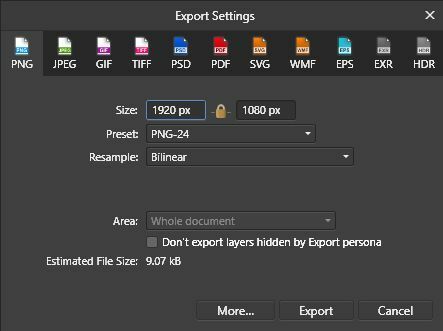 Looking at the export panel in Affinity Designer, there are a number of options to export raster and vector images out of Affinity Designer. Some options are better than others depending on what you want to accomplish. If you don’t know the difference between raster and vector image formats, check out this primer on the topic. The most robust Affinity Designer export option for vector image files is EPS (Encapsulated PostScript). EPS files can be directly imported into After Effects and behave almost just like an Illustrator file without a performance hit. 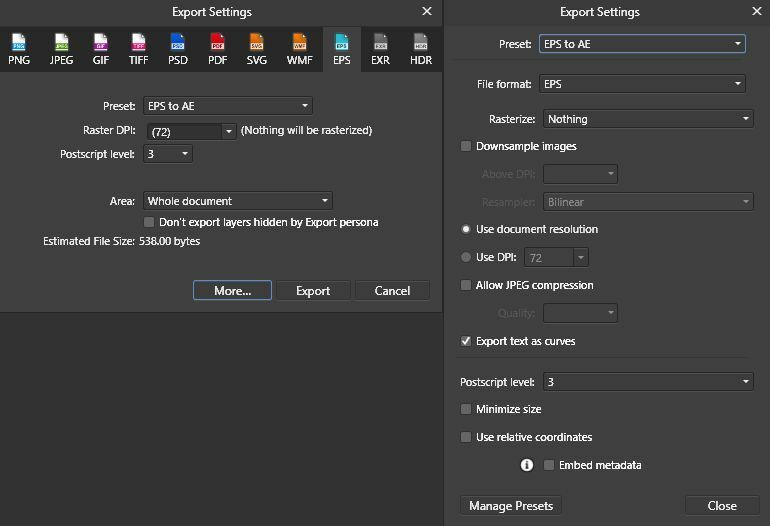 While exporting your imagery as an EPS, there are several export options available when you click on “More”. I have created a free custom preset for exporting EPS files from Affinity Designer to After Effects (see below). Note: If you don’t plan on converting your EPS file to shape layers, you can change the “Rasterize” option to “Unsupported Properties” to preserve transfer modes. EPS files imported into After Effects are always imported as footage. Most of these limitations can be overcome when we look at exporting imagery in a raster format below. Importing an EPS file as footage doesn’t give a Motion Designer much flexibility since most Designers will animate individual elements within the scene. To break up the EPS files into individual layers, an After Effects user has a few options. Here's a few tools you can use to breakup EPS files into individual layers. Using native After Effects tools. Place an EPS file on the timeline and select your EPS layer. Go to Layer > Create Shapes from Vector Layer. The EPS file will remain on the timeline while a duplicate of your artwork is created as a shape layer. If you have several EPS files that need to be converted at once, you can download a free script called Batch Convert Vector to Shape from redefinery.com. If you find yourself making conversations frequently, don’t forget to make a custom shortcut using ft-Toolbar or KBar for a more streamlined workflow. Once your EPS layer has been converted to a shape layer, all the layers are contained in one layer. Note: Another tool is needed to convert the shape layer into individual assets so that each layer from Affinity Designer will become one layer inside of After Effects. Explode Shape Layer from Takahiro Ishiyama (available for download at the end of the article) will move all the groups contained in one shape layer and create a new shape layer for each group. The process is fairly fast, but it depends on how many layers are embedded inside of the original shape layer. Just select your shape layer and run the script. You can download the Explode Shape Layers script by hitting the button below. The best part is the script is free! It’s great to have free tools to complete the basic tasks of importing Affinity Designer vectors into After Effects, but if a person wants even more options, then there is a paid tool that can help in the process as well. Explode Shape Layers by Zack Lovett can convert EPS files to shape layers and explode the shape layer to multiple layers like the free options. Explode Shape Layers also has ability to also explode only select shape layer groups, merge selected shape layers, and select only fills or strokes. The script comes with its own responsive design panel. Note: Due to the EPS file structure generated by Affinity Designer, ESL by Lovett can fail at times. If you have problems converting your assets, use the native tools or Batch Convert Vector to Shape from redefinery.com. My favorite feature of ESL from Zack Lovett is the ability to merge multiple shape layers into one shape layer. Often, individual objects are comprised of many elements that don’t require their own layer. Merging layers together and keeping your timeline tidy will make your mom happy. Now we are ready to animate! But wait a minute. The layer names are not useful. 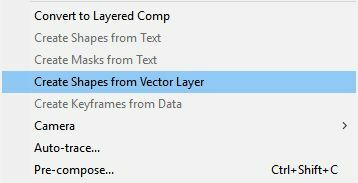 Converting vector files to shape layers inside of After Effects doesn’t retain layer names. Fortunately, if you have any of these scripts, your naming process can be sped up. Renaming your layers shouldn't take long at all! One last useful tool that can help in the organization process is Sortie by Michael Delaney. Sortie is a powerful script that will allow the user to sort layers based on a wide range of criteria which include but not limited to position, scale, rotation, in-point, label, etc. This may seem like a lot of work to use Affinity Designer for importing vectors into After Effects. So is it worth it? Well the short answer is Yes. Affinity Designer makes me feel like a kid again. A kid with lots of cotton candy! After you've used this workflow for a while, the process will become faster and faster. In the next article, We'll take a look at some advanced vector import options. Jinkies!